Nadia is a project led by the European Theatre Convention (ETC) in collaboration with the Fondazione Teatro Due Parma (Italy), the Toneelmakerij Amsterdam (The Netherlands), Det Norske Teatret Oslo (Norway), the Staatstheater Braunschweig (Germany) and the Théâtre de Liège (Belgium). The origins of this project are the questions raised by an increasing extremism in all parts of the world and more particularly by the phenomenon of radicalisation that it engenders. Initially, a text by the Dutch author Daniel Van Klaveren proposed by the Toneelmakerij Amsterdam that each partner institution has agreed to produce and to tour it in secondary schools. “Nadia” tells the story of two young girls, two teenagers, two close friends that nothing can tear apart until one of them met a young lieutenant of ISIS, by searching online for answers on her identity. Seduced by his egalitarian speech, by the dream of a better world that must be reinvented and built, she fell. Her best friend, Anna is witnessing her slow transformation. Other schools in Belgium are expected to present the show during this season. After a training at INSAS in Brussels (1983-1987), she assisted several directors, such as for Jean-Claude Drouot at the Théâtre National de Belgique and Isabelle Pousseur at the Atelier Sainte-Anne and the Théâtre de la Place (Liège). From 1990, she directed various productions at the Théâtre de la Place: “Broll” (1991) from François Sikivie, Le Vieillard jaloux in the show “Le plaisant voyage” (1996), “John et Joe” from Agota Kristof (2003). For the Mezza Luna, she also directed “Nuitnottenacht” (1995), “Clash” (1998) and for the Zététique théâtre, “Narcisse et moi et moi et moi” (1993-1994) ainsi que pour le Théâtre de Poche, “Les contes urbains” (2001). 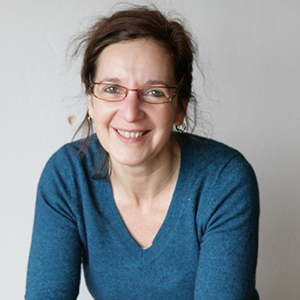 In 1997, she created the company Paf le chien and the eponymous show at the Théâtre Océan nord. She directed “Gaspard” from Peter Handke (2002) and “L’instruction” from Peter Weiss (2005) at the Théâtre de la Place (Rwandan distribution, toured to the Bouffes du Nord, to the Young Vic Theatre London, to Rwanda, to Japan and to the U.S). She is also involved in pedagogical activities in Belgium, such as Dramatic Arts professor at the ESACT/Conservatory of Liège and abroad (Moscow, Rwanda, Democratic Republic of Congo).